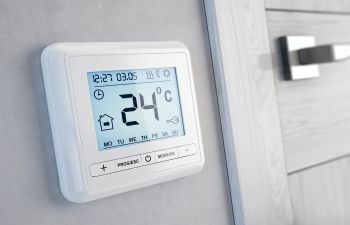 What’s more is that homeowners can tell their smart thermostat to turn off after leaving the house, only to instruct the thermostat to turn back on a little later in the day. Consequently, homeowners return to a home that is comfortable, while saving energy in the process. Perhaps you’re wondering how to instruct or manage a smart thermostat. Like other technologies, most are controlled through a phone or web app. In turn, if you’re concerned with saving energy, a smart thermostat will provide immediate feedback on the amount of energy you’re using and how much you’re spending through a remote interface. With this information in mind, suppose you’re wondering about the types of smart thermostats out there. While there are two main types, there are different models and varieties. In essence, one type adjusts based on the learned behaviors of the homeowners, eliminating the need for programming. This means that if someone turns on the oven, heating the kitchen and surrounding areas, the thermostat will adjust automatically to cool the area. The second type provides owners with the option of adjusting “on-the-go,” with Internet connectivity and mobile programming. As heating and cooling specialists, the team at ClimateSmith, LLC are well equipped to help you find the right features for your space. If you have questions about upgrading your system or installing a smart thermostat, call the licensed and trained technicians at ClimateSmith, LLC today.